Civil Unrest, Riots Coming To A City Near You! Revolution & Martial Law To Follow? With headlines screaming about the increasing food prices and alerts as to certain foods becoming unavailable, in conjunction with the examples shown below of what humans beings do when they cannot feed their families, the desperate measures they take, then the government’s reaction to the civil unrest and food riots, we have a good view at the “big picture,” what is coming, how it will play out….. and it is ugly. 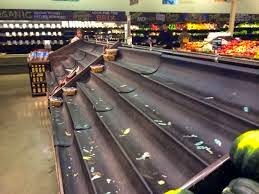 What naturally follows civil unrest and food riots? Martial law. The video below was uploaded by TRUTH FED, starting at approximately the 30 second mark, he discusses our future, goes over some articles including, but not limited to; the world bank’s warning of coming food riots as rising food prices pushes world populations towards revolt. As is shown, hunger leads to revolution…..